We had not been here because it is more expensive, but we really wanted to give it a try. Surprisingly it was not as expensive as we had thought. Plus the fish tacos we got were priced really well. I knew I was going to get the fish tacos. My husband couldn’t decide, but when we saw that everyone at the table next to us ordered the fish tacos, we thought it was best we both did. 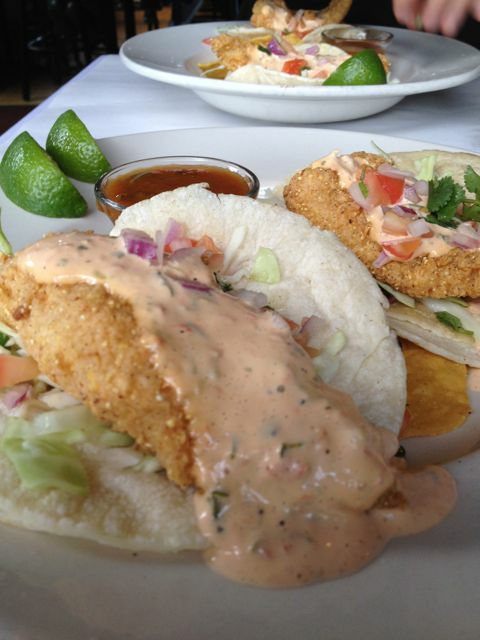 The cornmeal crusted tilapia fish tacos were excellent. They were served with lime cured cabbage, pico de gallo and jalepeno remoulade, served with tortilla chips and fresh salsa. Not just any tortilla chips, but Juanitas, which are made in Hood River. I love when restaurants support the locals!! We did ask our server if there was something we shouldn’t miss. Without skipping a beat she asks if we like brussel sprouts. I don’t just like them, I love them! So we ordered the Fried Brussel Sprouts with a fish sauce vinaigrette. OH MAN!!! I won’t lie, we were fighting over them. We ate them so fast it was embarrassing. It was the vinaigrette that put those over the top! Get these before they go off the menu. 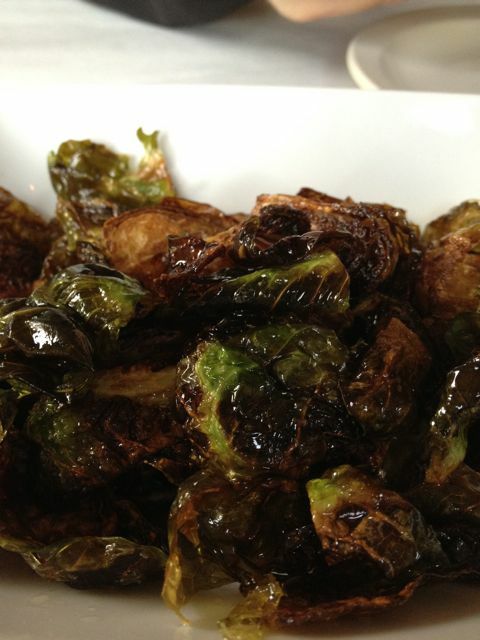 Brussel sprouts are a winter veggie after all. The drinks were creative and great. Lots of cocktails with fresh herbs. I have to say I am loving that new trend. Atmosphere is a cute old house that is packed tight with tables. The place was packed out when we were there. It was all locals. We know because they all kept greeting each other as they walked through the door. Pricing was a bit on the high side, but you can also choose to eat there affordably. Even though we chose food that was priced right, we couldn’t stop drinking the cocktails. Ooops! Lots of cocktails, good beer on tap (Mac & Jack), and a good wine selection as well. Service was great, so no complaints. We ate at Celilo for lunch. I had a beet salad, I am such a sucker for those. It was great. I have written this place up before, since we have been so many times, so read about it here. This is another place we have not visited in our many stops. We decided this was the trip to give it a try. We figured it might be super busy, especially after our experience with Brian’s Pourhouse the night before, so we made reservations. I am so glad we did. Of course we always ask what we should order and she quickly suggested the Peking duck wing “drumettes”, pickled Kiyokawa Orchard Asian pears. It sounded odd, but we trusted her. I am glad we listened because these were fall off the bone tender and marinated with a great sauce. Very, very good. I got lost in another beet salad. This one had avocado and blue cheese. It was very good as well. 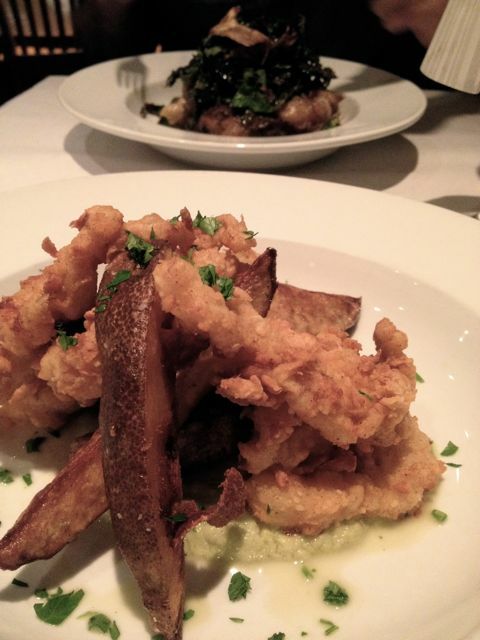 The menu was full of so many great choices, but the thing that caught my eye was razor clams. I love razor clams. It came with potatoes and a celeric coulis. I am good about asking, but I did forget to ask what this was. 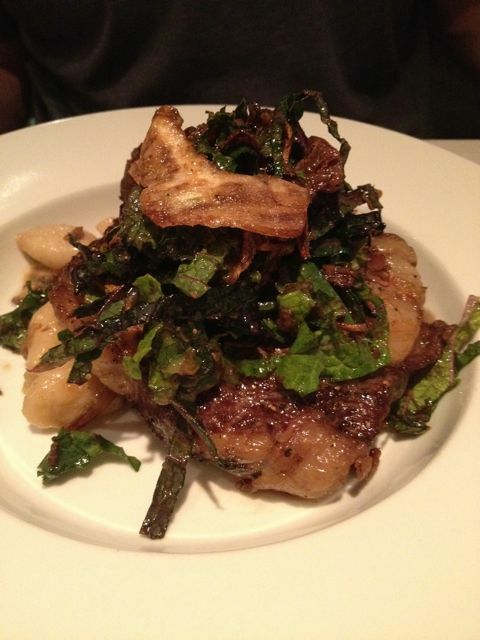 My husband ordered the Rib eye steak with gnocchi and a winter kale salad. Our food comes out. I take one bite of the razor clams and they are perfect BUT the celeric coulis was like pureed celery. It’s not that I don’t like celery, I HATE celery. (I know….rookie mistake and it was all my fault!!) Thankfully my husband loves celery and really loved this dish, so he took over that plate and I took his steak. What a guy! Just for the record I eat tons of veggies. Celery is the only one I don’t like. And you should also know that my husband mocked me for making this mistake. The steak was very good, but it was the gnocchi with horseradish that stole that show! Hands down best meal of the weekend. We later learned that the owner does all the cooking and comes up with all the menu ideas and her husband is out waiting tables. No wonder this place has such high reviews. Everything is perfect. Update: Breakfast is just as good. We have done breakfast here a few times and have loved it. Atmosphere is so quaint in the little house. I so wish we would have sat up at the bar stools that over look the kitchen. I like watching how things are prepared. Service was great. Even though we were there at 8:00 they were still busy and still working their tails off. Pricing is definitely on the high side. Great place for a special, romantic dinner. Great wine list, some good beer choices as well, skip the cocktails. Locate in downtown Hood River. Before we left town we got pizza and beer at Double Mountain Brewery. There was quite a wait, but it is always worth it. One breakfast we ate at Columbia River Hotel. It was wasn’t as good as it was last time we went. We also did breakfast at Dopio coffee shop, which was a perfect amount of food. We skipped Dog River Coffee this time to try out 10 Speed Roasters. Great little shop. We didn’t go to 3 Rivers Grill only because we drove through a few weeks earlier and stopped then. Don’t worry, we got some good walks in and we did the Hood River to Mosier bike ride. Just in case you are wondering how I eat like that!